Ah, seems like only last year that Robert Pollard spoiled longtime fans of his band, Guided By Voices, with new music. Wait, it was last year. In fact, GBV released two albums last year. To be honest, there have been so many releases over their illustrious career that I have failed to keep up with some of it. On top of classics like Bee Thousand, Alien Lanes and Isolation Drills, there are a plethora of other albums littered in that can be overwhelming for someone unfamiliar with just how prolific Pollard and company can be when it comes to writing, producing and releasing music—good music, too. I feel the band has been dropping really good stuff, mostly through their own label, since 2012. Space Gun ranks right up there with the best of what they have been up to, maybe right on top. With 15 tracks, Space Gun wouldn’t be complete without several songs under two minutes containing bizarre lyrics that give listeners a quick glance into a much larger world, like a vignette or a brief moment captured in a song that begins and ends before people realize they should be paying attention. I have always thought of Guided By Voices’ short songs as the ones that should be listened to the closest. There are some really strong standout tracks on Space Gun too, both standard length and short, beginning with the title track, which is also the album’s opener. It reminded me a lot of “Evil Speakers” from the old days. It’s a good single, enough to get followers primed and ready for the rest of what’s coming. “See My Field” is the album’s second single, which has generated a little buzz as well. Like a lot of Guided By Voices songs, there is a touch of Michael Stipe on this one, a good thing and part of why it stood out to me. My favorite track on the new album is “Blink Blank.” I played it over and over. The lyrics are sharp, the wordplay entertaining and the guitar riffs powerful. Overall, the song is grabbing, contemplative and open to interpretation. It was certainly worth repeating a dozen times. 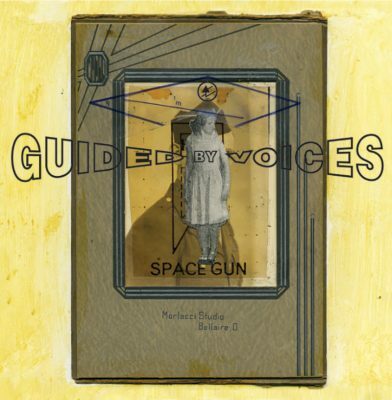 Space Gun is a good album, much like any random handful of Guided By Voices projects one might pick up. In fact, that is sort of how I was exposed to the band in the first place. A friend told me that they were worth checking out, so I went to Graywhale and bought all three of the used albums they had. It was a haphazard pile of music, no particular significance. It was just all the store had that day. It turned out well for me. I ended up loving all of them. As the music has continued to roll out for the band, I’m pretty sure I could have replaced any one of those three LPs with almost any album the band has released to date, and the results would have been the same.